Untitled (Buoy), is a performance by Jennifer Locke and Tad Beck for the opening of their collaborative exhibition Capsize. At the beginning of the evening a model walks into a vertically oriented space with a pole in the center. A door shuts behind him, and he can be viewed through a mid-sized window framing the scene. He inflates a black life raft, removes his clothing, and sits on a bosun’s chair. He becomes a body. Locke and Beck enter the space. Beck hoists the body up and he and Locke place it seated on a jackstand situated in the center of the raft. Beck raises Locke up on the bosun’s chair, where she covers the body in gallons of Elmer’s glue. Beck and Locke leave the space. 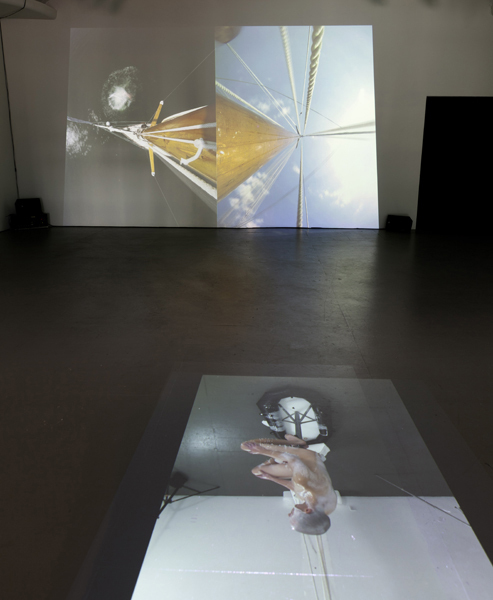 The action is not merely “live.” A camera mounted in the space broadcasts a live feed of the proceedings to the center of the exhibition two rooms away. Time passes. The body rotates and becomes images–stills, videos, text messages, blog posts. The glue dries and grows transluscent, an erased erasure. I feel the strain of the body, its exhausting attempt to be sculpture. The violence of it, as in Beck and Locke’s other works, then becomes something else. The artists return to the room and Beck raises Locke in the bosun’s chair. She gradually, tenderly begins to remove the glue in one sheet. The glue removed, Locke and the body are lowered by Beck. Beck and Locke tidy the space, the model dresses, and the three exit, concluding the performance.